I’m Joseph Kneeland, aka ‘Omni’, and I’m a freelance web developer. I’ve been successfully building unique websites for other peoples business ideas for over fifteen years, and I’ve even built a few projects of my own. My own projects never seemed to get off the ground however, as I needed more marketing power to get customers. That’s why I’m campaigning for funds for the PlantDreams project. 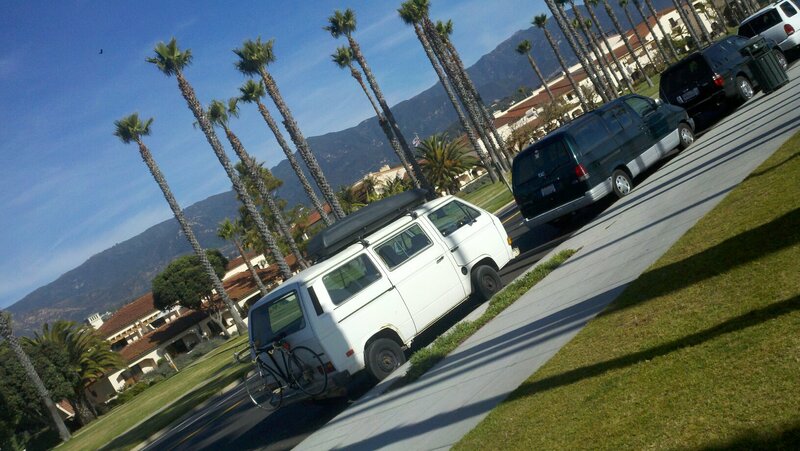 The idea for PlantDreams came to me in 2012, when I was traveling cross country in my VW van. I stayed a while in southern California, and was working with my laptop when I saw so many people ‘homeless’ without anything productive to do. I realize that some homeless people have mental health issues. But for many feeling lost, the depression and anxiety can be helped by having a passion and a purpose each day - and having some way to actively contribute to their fellow human beings. Everyone needs a purpose. 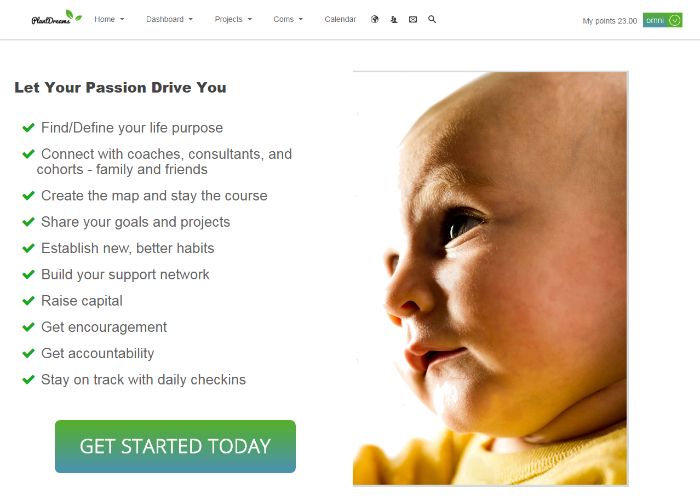 So, being the web developer that I am, I grabbed my notebook and started designing a system where anyone could connect with the coaches, social resources, and other helpful folk - to get inspired and oriented toward whichever pursuits are right for them. A way to be working toward the lifestyle they truly desired and could feel good about. Honestly, I needed some of this medicine too. I think everyone might. Enter PlantDreams, where those who qualify can get hooked up with a free life coach and anyone can use the network for social support. I've already found many, many professional life coaches willing to volunteer. With or without a coach, everyone can establish and share goals, projects, and progress. PlantDreams is designed for social support networks, for people to send each other tips, leads, direction, and encouragement. 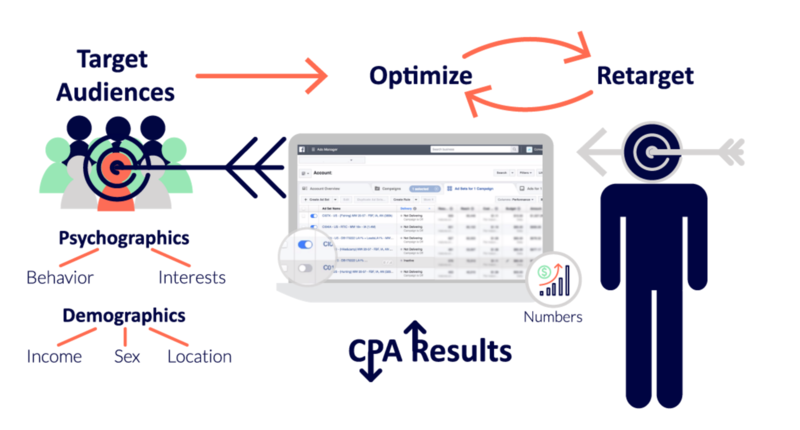 In addition to mission oriented profiles, each client gets progress trackers. Other built in tools include project management, crowdfunding, freelancing (community currency coming soon), and a personal calendar. The dashboard for daily checkins helps clients stay on track and work together. Funds raised here will go to marketing PlantDreams to those who need it most. Our initial target market is those in poverty who have a Will to change that fact. Now, I’m a genius coder but marketing isn’t my game. In order to find and win over these clients, some of the funds from this campaign will go to hire a solid ally - a known and trusted marketing guru named Justin Richard (his company is Convert Marketing). Justin and I have worked on projects together before and we're a great team. Coincidentally, he lives in the same town I was in when the idea struck me! We'll work together to set up an effective marketing campaign, and that campaign will be funded as well by your generous contributions. We’ll target precisely and convert like missionaries. If growth demands my full attention for fixing bugs and developing essential features I might also need to quit freelancing and work exclusively on PlantDreams, in which case some funds might go to hire me at my regular rate. At this stage though I'm happy to work for free as long as I can to keep the finances focused on client outreach. In addition to contributing funds for the launch of PlantDreams, you can also help by using the site and providing feedback. Feedback is better than gold at this point in the project, please be in touch! There’s also an invitations tool on PlantDreams if you would be so kind as to help spread the word. Folks you invite can then become part of your support network! I’ve never been a fan of getting something for nothing. And even though your financial contributions will be going towards the PlantDreams project, and not my own steak dinners and vacations, I still want to give something back to all who donate. As a show of thanks, my gift to you is advertising credits at an astonishing 7,000,000% discount below fair market value (If you had bought it that is, actually we’re gifting it to you). For every twenty dollars you donate, we’ll send you a voucher code - which when redeemed will grant you 10,000 ad clicks from your text advertisement on PlantDreams. These vouchers can be resold or traded. To give you an idea of the potential value, one click in the personal development niche sells http://link-source.com for as much as 7-11 dollars. These ad packs will only rise in value as PlantDreams grows. 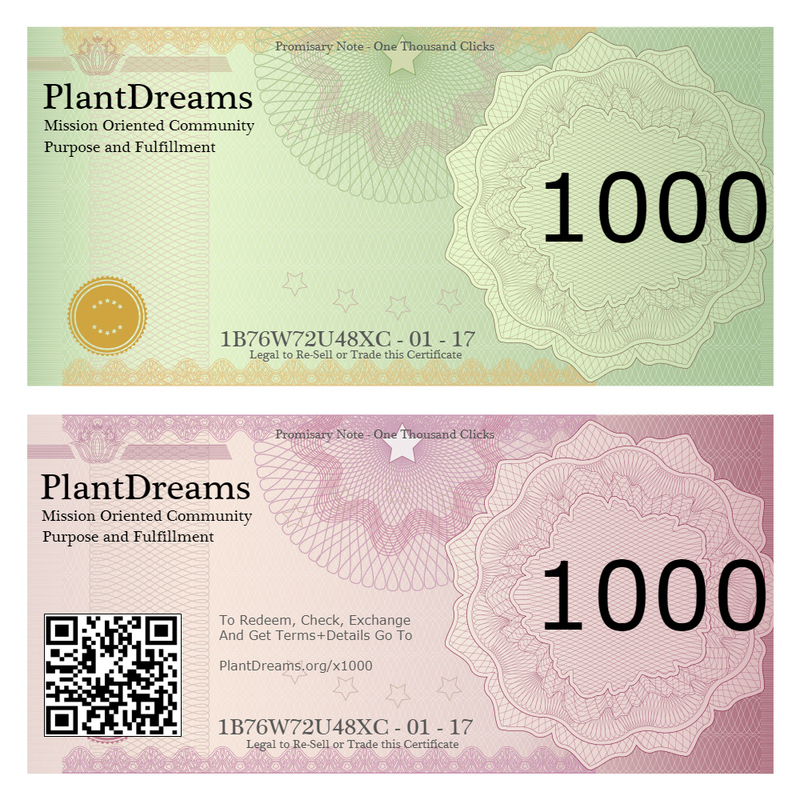 a community currency to be used on PlantDreams - in an amount equal to your donation. Please, give as much as you can so we can help everyone wake up to a passion driven life, with the support network and tools they need to create a better way and a better world. This project will receive all of the funds invested by 17 April 2019.